The Valdai Discussion Club and the Indian Observer Research Foundation (ORF) are launching a new bilateral expert project. On April 9, 2019, the Valdai Discussion Club hosted a conference, titled “Indian-Russian Relations in a New Strategic Context”. When you start to blend sanctions and trade wars, so you want to simultaneously reach foreign policy goals and make some good fortune due to trade wars – you probably lose on both tracks. For Russia and India today is extremely important to tune their priorities and then adjust sanction-resistant solutions. The Valdai Discussion Club and the Indian Observer Research Foundation (ORF) are launching a new bilateral expert project. 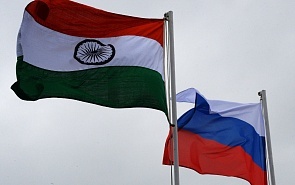 On April 9, 2019, the Valdai Discussion Club will host a conference, titled “Indian-Russian Relations in a New Strategic Context”. Photo Gallery. Indian-Russian Conference. Session 2. Sanctions and Trade Wars: How to Address Them?